Joni M. Jordan, 76, passed away April 30, 2015 in Del Rio, Texas. She was born July 25, 1938 in Brackettville, Texas. She is survived her daughter: Eva Lanell Jordan Woods of Mesquite, Texas; sons: Willie Mack Jordan, Jr. of Dallas, Texas and Irven Jordan (Mary Keitha Robinson) of Houston, Texas; brothers: Richard Ray Griffin, August Larry Harris and Clifford McBrine; grandchildren: Cacedra LaTre Jordan of Del Rio, Texas, Julius Jermaine Jordan, Irven Alan Jordan and Chanel Monee Mitchell of Houston, Texas; also other family members and friends. She was preceded in death by her mother: Eva Mae Griffin and son: Kevin Raynard Jordan. 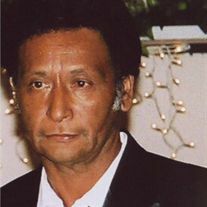 Joni M. Jordan was born and reared in Del Rio, Texas. She graduated in 1956 from Tarver High School, here in Del Rio, Texas. She began her Federal career in early 1971 as a temporary Clerk-Typist, GS-3. She then obtained a non-appropriated Accounts Clerk before being appointed in August of 1972 to a permanent Clerk-Typist, GS-3 in Civilian Personnel. Later became an EEO and Staffing Specialist and spent 22 years in that field. In 1994 she was re-assigned to the position of Employee Relations Specialist and spent a period of time temporarily as the Labor Relations Officer. Joni was involved with events and causes both in her career and the community. In 1975, working very closely with Texas Rural Legal Aid, inc., she organized the Del Rio Housing Tenants Organization to address and attempt to solve the irregularities in the administration of Del Rio Public Housing Programs. As President, the efforts of this organization brought to public attention many hidden irregularities that had existed for years. In 1977 she organized the Black Heritage Committee to plan and execute programs for what was then Black Heritage Week and was Chairperson of this committee involved in base and community activities for over 27 years. Ms. Jordan was active in the field of EEO and served as the Black Employment Program Manager for Laughlin AFB from 18 Jun 79 to 17 Aug 88 and was reappointed to this position in 1994. She was selected as the Best Black Employment Program Manager in Air Education and Training Command for 1997, 2003, and 2004 and selected as the Best Black Employment Program Manager for the Air Force Distinguished Equal Employment Opportunity Award in 2004. Joni retired from LAFB after 38 years of dedicated service. Her years of service started in 1971 and she retired in 2009 as a Human Resources Specialist. In April 2000, Joni planned and organized the first Juneteenth Celebration in over 60 years which included the first Black sponsored parade to march up Main Street in Del Rio. In addition, with Diana Salgado, they planned and organized the first Martin Luther King and Cesar Chavez March. They also planned the MLK and Cesar Chavez Scholarship Award Dinner awarding 2 scholarships in the name of each. She was a direct descendant of the Black Seminole Indian Scouts who were stationed at Fort Clark in the 1800's; was an active Board member of the Black Seminole Indian Scouts Cemetery Association in Brackettville, Texas and a member of the Greater Mount Olive Baptist Church. Visitations will be on Friday, 6-9:00P.M, May 8, 2015 at G. W. Cox Memorial Funeral Home Chapel. Funeral service will be on Saturday, 1:00P.M, May 9, 2015 at the First Baptist Church, 301 First Avenue G, with Reverend E. Rendell Tarver, Reverend Travis Norwood and C.J. Pierce presiding. 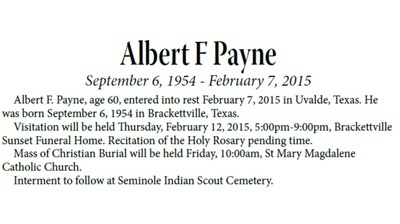 Interment will follow to the Seminole Indian Scout National Cemetery, Brackettville, Texas. 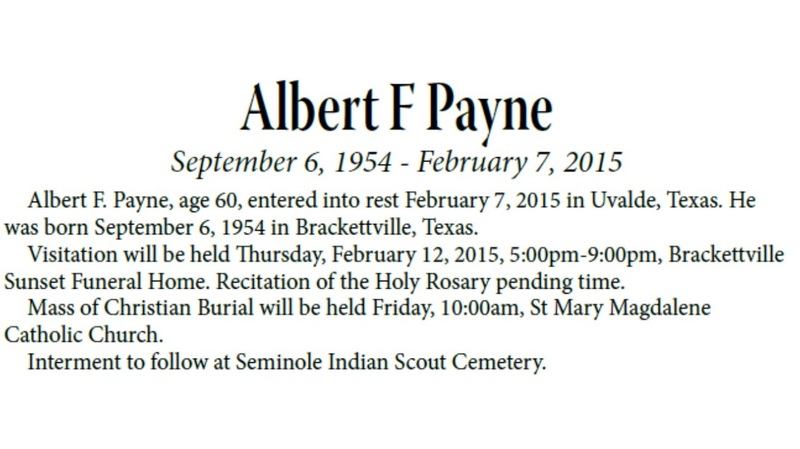 Funeral arrangements with G. W. Cox Memorial Funeral Home, of Del Rio LTD, 114 Fletcher Drive, Del Rio, Texas. 78840 Ph: 830.775.2000.